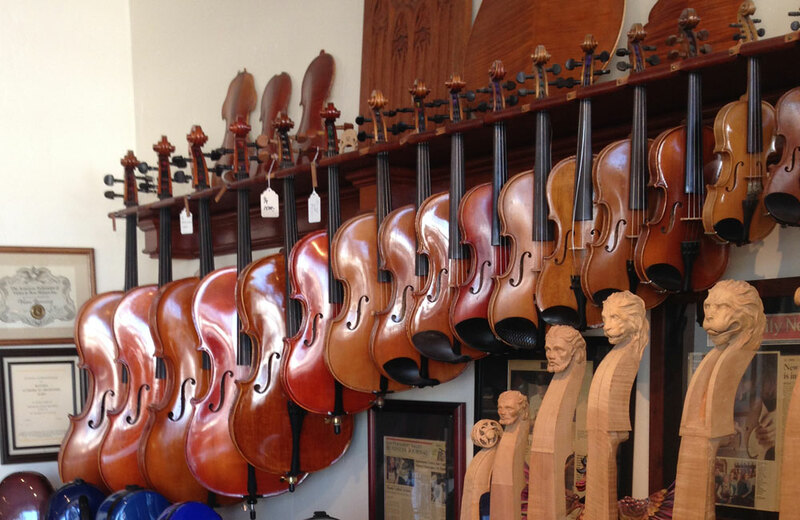 Violins, violas and cellos are made in a variety of sizes, mainly for youth. Violins and cellos have standard adult sizes as well as a slightly smaller 7/8 adult size usually for women and older teenagers. Full-size violas range from 13” to as much as 17” and up. Violins come in nine main sizes, and the cello comes in eight. Though the instruments may vary in size, all versions of each violin, viola and cello are identical in range of pitch and the ways they are constructed and played. 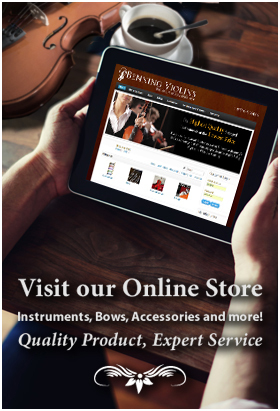 The violin comes in two adult sizes, the full “4/4” size at 23”-23.5” long and 14” wide, known as the standard size, as well as the “7/8” size at 22.5” long and 13.5” wide. Seven sizes are made for youth ages 3 to 12, each size based on the arm length of the player: 3/4, 1/2, 1/4, 1/8, 1/10, 1/16, and 1/32. Violin bows match the violins with varying sizes as well. For children under 3, cardboard violins are recommended. Violinists can test to see which size is appropriate by comparing the instrument length to their arm length; the two lengths should be similar. Violas are between 1 and 4 inches longer than violins. The viola has no standard size, but the most frequently made viola body is 16”-long, and other typical sizes are the 13”, 14” and 15”. 13.5”, 14.5”and 15.5” sizes are less common. For youth, a child-size violin is sometimes strung with viola strings to achieve the same sound at a smaller size. Violists can measure the viola by placing it below their chin and then reaching to the scroll. With their arm under the viola, they should be able to wrap their hand around the scroll with some bend in their elbow. Cellos come in two adult sizes, the 4/4 standard (48” tall) and 7/8 size, as well as five junior sizes: the 3/4, 1/2, 1/4, 1/8, 1/10 and 1/16 sizes. 17th-Century cellos were substantially bigger than today’s average cello. A cellist’s 24” arm length is good for a full 4/4 size cello. Players with 18” to 22”-long arms are better served by smaller cellos.